One of the things I hated the most when my older two kids were born were the constant falling pacifiers. They would fall onto the floor... lord only knows what has been on those dirty floors everywhere you go. Ewww! Or fall in the bottom of your diaper bag... that bottomless pit you put the whole baby room into. Pacifiers used to be a pain to keep up with and not to mention the creative ways, you know we have all done, to clean them off before putting them back in baby's mouth. Come on, you know you have put those little biscuits in your mouth to clean it off when you have absolutely no other source nearby just so you could quiet those screams. Thank you Schneider family for making these adorable little WubbaNubs! I first learned about these when I saw a friend of mine had a pink bear for her little girl. I was pregnant with Roman and immediately added them to my baby registry. These are a must have for every mom. They are so cute and they come in many animals and colors. The part I really liked about these before I even used them, were the type of pacifier they designed these plush animals to attach to. The Soothie brand pacifiers that most hospitals use when baby is born. They are the best pacifiers and now even better! Roman loves his WubbaNubs. He has a bear, frog and red dog. If he lets go of his pacifier from his mouth, the WubbaNub stays put. 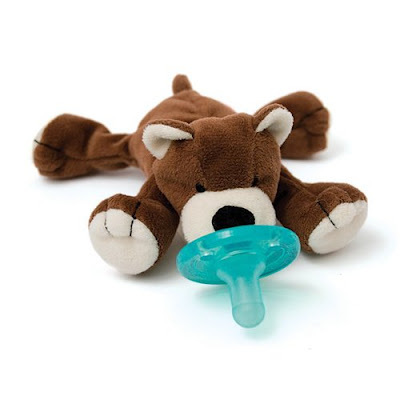 It does not roll away, and he can easily grab onto the little animal and put the pacifier in his mouth by himself. It is very easy to catch the plush animal if it starts to fall away, than to fumble around with just a pacifier in a juggling act. LOVE, Love. love this product! They are definitely worth the money. I could see how falling pacifiers could cause distress. But it must work wonders for an immune system! One boy one baby ,have a big love.